I have the new kitchen cabinet shellacked now. Three coats of wiped in amber shellac. I was nervous to shellac a piece with so many details, but it went very smoothly and actually needed no sanding. I've started to move my dishes in. This is a first, because my vintage cabinets are too shallow to accommodate modern plate sizes. Until now, I've been storing my dishes in the dining room buffet. I even had canning wax on hand to wax the rails of the drawer. It's been hard to photo the kitchen because it's relatively small (approx 10'x11') and for some odd reason, when I don't use a flash I get a weird amber glow on everything...and when I do use a flash, everything is overly stark. Imagine somewhere in between. I still need to hunt down vintage latches for the three doors. And the carpenter is going to come back to cut the crown moulding. I may have posted pictures of these when I first bought them a few years ago (okay, 5 years ago). But, here you go again. Photos of the lights going up in my kitchen. I made one little discovery the other day. For some reason when I ordered the lights for over the sink (the double) and for the wall, I forgot to have a switch/chain added as these are not connected to the light switch. So, I think I'm going to bring them to LightWorks Lighting to have them added. Fingers crossed that when I remove the current sink & wall light, I find updated wiring (I did in the ceiling). Quick little fun project last night. I stenciled a quick little "frame" on to the bottom of my new kitchen cabinet's drawer. Same colors as my soon-t0-be-installed wallpaper. My Mom was the one who motivated me to get going on this whole project, so I thought I'd ask her to write a little "dedication" of the new cabinet. Fun to just know it's down there...and will add some unexpected historical interest for future owners. Okay, here are a few shots of my new kitchen cabinet with it's base stain. John, the carpenter told me I needed to get the stain & one coat of finish on the piece asap to keep it stable from humidity. This was a good thing for me to hear. Without this pressure, I'd have put it off for who knows how long. Truth be told, I was nervous about staining it. This way, I just had to do it. The photos look a little blotchy, but that's actually the natural grain of the birch. In real life they aren't quite as pronounced. The countertop is going to remain unstained & finished with food grade oil. It should patina over time. The color turned out well and virtually matches the original 1924 cabinets. The next step is a multi-coat application of amber shellac. I really, really like this cabinet. You can see a little swatch of peach paint on the plaster next to the pull-out bin. I stripped the plaster of paint around the cabinet space....leaving the paint on the plaster where I thought the cabinet would be located. No use stripping paint that will be hidden, right? Well, I forgot that the cabinet jutted in on the top. So, now I need to come up with some clever way of getting that paint off without hurting the cabinet. I might be able to just scrape it off with a razor blade. We'll see. Check out the reinstalled baseboard. This is the original birch baseboard I stripped & reshellacked. The old birch wood has patina so there isn't a need for stain. Pretty close match to the cabinet, huh? 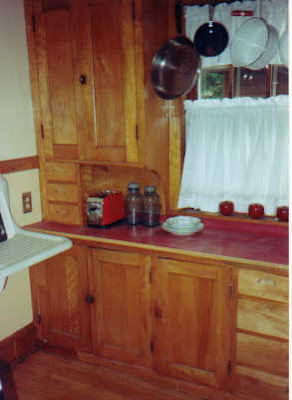 Finally, the last photo is of the vintage cabinets on the other side of the kitchen (the ones we are trying to replicate). I'm going to break the photos of my new kitchen cabinet into a few different posts. First, the cabinet installed unstained. It's odd taking photos in the room filled with amber shellac. The photos take on an odd orangy glow. If you use flash, the color looks too bright. It took John, the carpenter from Scheftel Construction, most of the day to install the cabinet. Keep in mind that the floors are not even and the plaster is far from flat. It took no small amount of finessing to get the cabinet in, square & well fitting - all without punching a hole in the new ceiling tile. I'm trying to leave a bit of a "story" for future owners, so I left a note where the old stove vent hole was to tell them I patched the hole with concrete and covered with plaster. I asked John if he would sign the back of the cabinet. I've also been putting the date on the back of the baseboard I'm restoring. I'll put a copy of the original drawing on the top before the crown moulding gets installed. I figure we'll give some bungalow restoration geek in the future a little thrill. Exhausted tonight. Last night I painted my new ceiling in preparation for the carpenter arriving bright & early this morning. Today, I spent the day trying to keep busy while the carpenter installed my new kitchen cabinet. Then, I spent the evening staining the cabinet (ok, I confess....and running to the tv to see what happened on The Bachelorette). Too tired to post, but trust me I took loads of pictures. I'll post them tomorrow. Need to go sleep now. Aged Over 2 Years (85 To Be Exact). My dad & I have been working on a project in my basement. More on the project when we get further along. But, I thought it would be fun to post one of our discoveries. This cut up poster was being used in a cabinet in my basement. I'm hoping we can find the missing pieces somewhere down there. I've run into a tiny snag in the kitchen ceiling installation. I'm replacing the light in the center of the room. I know the the electrical in the kitchen is new-ish, so I thought for sure all I'd have to do was pull down the old light & put up the new. The electrical box was evidently installed before the furring & old ceiling tile was. With the old light, this didn't matter as it was loosely screwed in with really long screws. However, unless I want the base of my new light to buried below the level of the new ceiling tile...changes need to be made. I'm sure this is a pretty easy job. But, I once had an electrician tell me the story of how his boss was electrocuted to death in front of him. This made a big impression on me. Good grief, if an electrician can kill himself...imagine what I am capable of. I need to have an outlet added and one moved anyway. So, an electrician will be called. In the meantime, I'm finishing off the ceiling in the corner where the new cabinet will be installed (shortly). After working on it for two full days, I don't have the will to write anything more than....the kitchen ceiling is going up, and the hideous white ceiling light is forever gone. Things in the kitchen are starting to come together. Today I picked up the paint for the ceiling. It is a lighter version of the same vintage green color I have on my dining room walls. I'm embarassed to admit that I spent a lot of time looking at paint chips to match my wallpaper before I realized that I already had a green that would work. I wanted a very light green for the ceiling as the wood, wallpaper and red paint are pretty dark. I also am trying to avoid a whole "Christmas" color theme. For some reason it's always a big fat challenge for me to get paint custom colored. The current dining room paint is a Sherwin Williams color. I prefer Benjamin Moore paint. On top of this, I wanted a 25% tint for the ceiling. Went to paint store "A" (who I know mixes custom colors) and I told the guy what I wanted. He looked at me like I was an idiot talking gibberish when I asked for a lighter ceiling tint. Then like I asked him to make paint out of lemonade when I told him I wanted to match the color. Then he got all condecending and explained in slow words that SW & BM were different paint companies. I took my paint chip from his hand...told him I was going to think about it. I then got back in my car and drove clear across town to Hirshfields, where they took my chip, listened to what I wanted, gave me helpful suggestions & mixed my BM paint. Next time I have to remember to go directly to Hirshfields...or at least wait for one of the full-time guys at store "A." In the photo, the ceiling tile is painted with the final color on the left..and the dining room green on the right. The shine on the shellacked trim on the photo needs to be knocked down to a semi-gloss finish, but you get the idea. The vintage red paint chip is for the wall below the chair rail (currently being stripped of paint so you can more clearly see the scored plaster). I waffle on this color...but always come back to it....we'll see how it goes. And there's the wallpaper for above the chair rail.